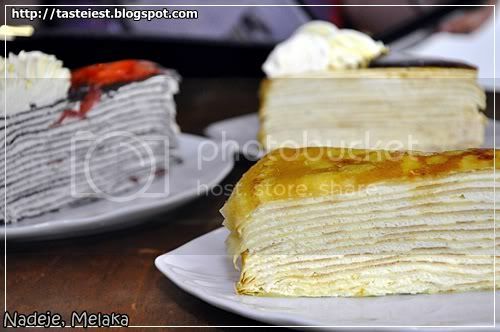 After salvage some good food in Kuala Lumpur, we heading down to Melaka for our food hunt. 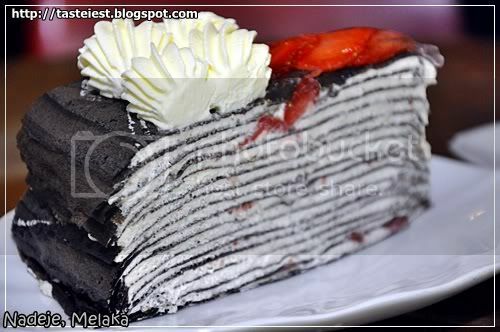 Nadeje Melaka is definitely top of our list after hearing so many good reviews and recommendation from friends. 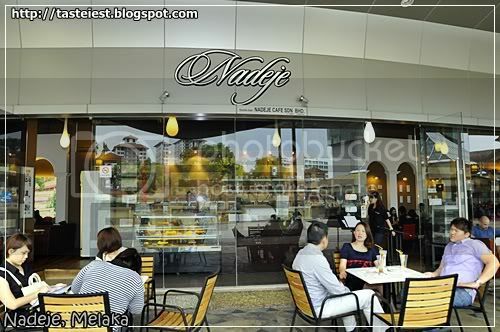 Nadeje located at the top of Dataran Pahlawan, big restaurant with see through glass covering the shop given a classy look. One corner of the restaurant decorated with home like design with few sofa and magazine, another corner fill with Starbuck like table for internet surfing. 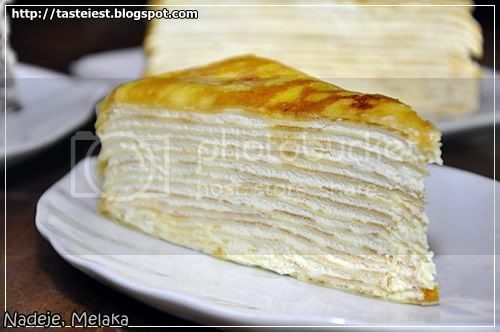 We ordered 3 Mille Crepe, yes! 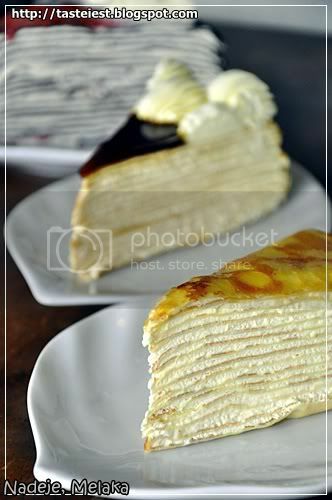 We are crazy enough to ordered 3 Mille Crepe for two person. Well! We are traveling 600+KM down from Penang to Melaka and we must fully appreciate the journey by eating as much as possible. 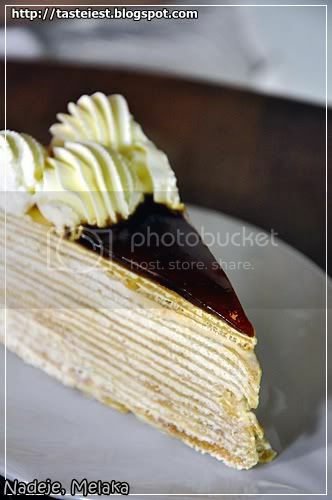 Original Flavor is made from egg and vanilla top with thin layer of caramel. It given a melting texture immediately after first bit. 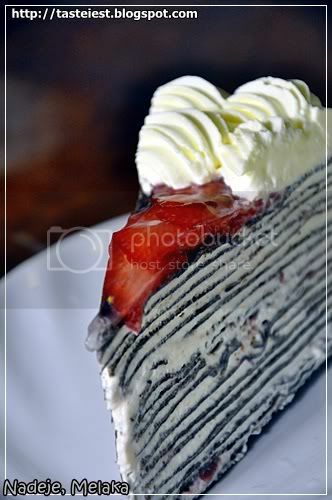 Chocolate Strawberry, a thin layer of chocolate fit between cream and top with strawberry. Light chocolate flavor with sweet cream covering by soul strawberry is so tasty. 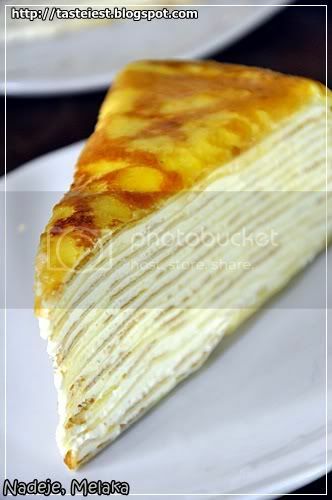 Gula Mallaca, very strong Gula Mallaca flavor on top of the mille crepe, it slightly too sweet. 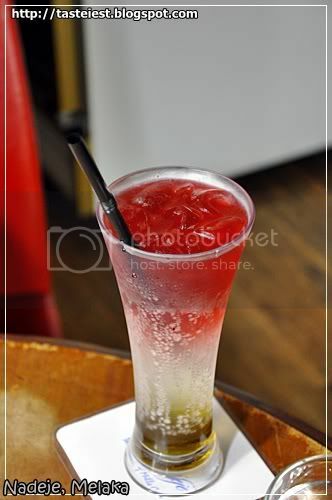 Roman Holiday RM5.80, colorful refreshing drink with kiwi and banana at bottom, soda drink at mid and top layer with hibiscus, each layer got its own uniqueness and surprisingly the mixture create a different level of specialty. Great! 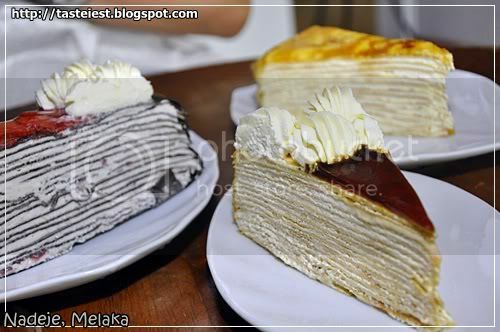 I would say it was one of the best cake I ever had so far, no doubt Nadeje has become one of the tourist attraction and Mille Crepe is Malaca signature dish!